(Friday) - PRCA Rodeo at 7 p.m.
Tickets range from $6.00 for General Admission to $9.00 for Reserved Seats. This pricing does NOT include gate admission to the fair. Friday night's performance is our Tough Enough to Wear Pink performance. One dollar ($1) from each rodeo ticket sold will be donated to breast cancer awareness in the Inland Northwest. (Saturday) - PRCA Rodeo at 7 p.m.
Tickets range from $6.00 for General Admission to $9.00 for Reserved Seats. This pricing does NOT include gate admission to the fair. (Monday) - Old Dominion's Happy Endings World Tour with Special Guest Brandon Lay at 7 p.m.
Tickets range from $35.00 for General Admission, to $45.00 for Reserved Grandstand Seats, to $50.00 for Golden Circle Standing Area, to $75.00 for Golden Circle Party Pit Standing Area. This pricing includes gate admission to the fair (required to attend the event) when purchased prior to September 6. (Tuesday) - Josh Turner at 7 p.m.
Tickets range from $30.00 for General Admission, to $35.00 for Reserved Grandstand Seats, to $40.00 for Golden Circle Seats (Rows 6 through 24), to $45.00 for Golden Circle Seats (Rows 3 through 5), and $50.00 for Golden Circle Seats (Rows 1 and 2). 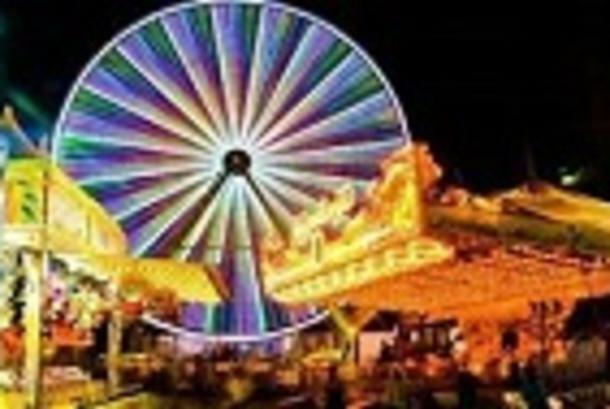 This pricing includes gate admission to the fair (required to attend the event) when purchased prior to September 6. (Wednesday) - Jeff Foxworthy at 7 p.m.
Tickets range from $30.00 for General Admission, to $35.00 for Reserved Grandstand Seats, to $40.00 for Golden Circle Seats (Rows 6 through 24), to $45.00 for Golden Circle Seats (Rows 3 through 5), and $75.00 for Golden Circle Seats (Rows 1 and 2). This pricing includes gate admission to the fair (required to attend the event) when purchased prior to September 6. (Thursday) - Nixon Rodeo at 7 p.m.
(Friday) - Truck and Tractor Pulls at 7 p.m.
(Saturday) - Demolition Derby at 7 p.m.
(Sunday) - Demolition Derby at 4 p.m.
Back by popular demand (but in a brand new location), watch as these finely tuned athletes race for Oreos and Twinkies. These "hams" are sure to please the entire family. The "racetrack" is located on the South Lawn. Show times are (to be determined) daily. The tractor pull area is located in the center of the Racing Pigs track on the South Lawn. Watch as kids use their muscles to attempt a "full pull" on these adorable kid-sized tractors. Show times are (to be determined) daily.